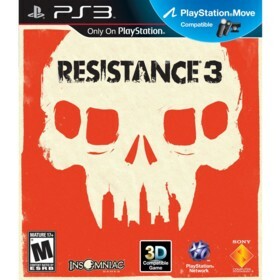 Resistance 3 is a Playstation 3 game in the FPS genre. The game was published by Sony Computer Entertainment and developed by Insomniac Games. The game has an ESRB Rating of M (Mature 17+) and was released on 2011-09-06. The game's official site can be found at www.insomniacgames.com/games/resistance-series/resistance-3/. The best game in the Resistance series! I own and have completed the first two games in the Resistance saga. I really liked the first game, but found the second game slightly disappointing so I decided to take the rental route this time around. So far I like this game much more than Resistance 2. The story itself takes off right where Resistance 2 left off - I won't go into details for obvious reasons since the game only just came out and I don't want to ruin anything. The graphics are much improved over the previous installments and carries over the aspects that differentiate the Resistance series from other generic FPS games - massive environments, massive enemies, and massive weapons. The campaign itself is fairly lengthy for an FPS game, which is also becoming a rarity these days. The co-operative mode from the previous game has returned, but this time Insomniac has made it slightly different. For one, the 8 player co-op mode from the previous game has been nixed and there is no way to join up with random people online (i.e. there is no online coop matchmaking so whoever you want to play the story with has to be be invited to the game or be on your friends list). Also, Insomniac has finally added the ability to play through the actual story itself in co-op which is awesome given how great it is this time around. Another strange alteration Insomniac did was scaling down the competitive multiplayer matches from 60 players to only 16. Even though some may see this as a "downgrade", I actually preferred the matches being more tight and focused rather than having 60 people running around like chickens with their heads cut off :). All of the awesome weapons from the campaign mode are present in multiplayer as well and each still has their signature second mode, like the grenade launcher and the bullet tracker. My only negatives are the aforementioned lack of campaign matchmaking and the sometimes "dumb" partner AI during the story mode, but as long as you have some friends to play with neither of these are real issues. Overall, I spent well over 20 hours playing the game during my rental period and will definitely be picking this game up around the holidays to play some more of the great multiplayer modes. Definitely pick this game up, Resistance 3 is by far the best game in the Resistance series.